The threat to California’s flower farms from several Southern California wildfires is almost over. (Insert collective sigh of relief here). That said, flower farmers and others in the ag community can tell you it was an experience like no other – and something they hope to never experience again. While fire officials are now focused on “mop up” activities in the Carpinteria area, the Thomas Fire appears to have left flower farms largely unscathed. 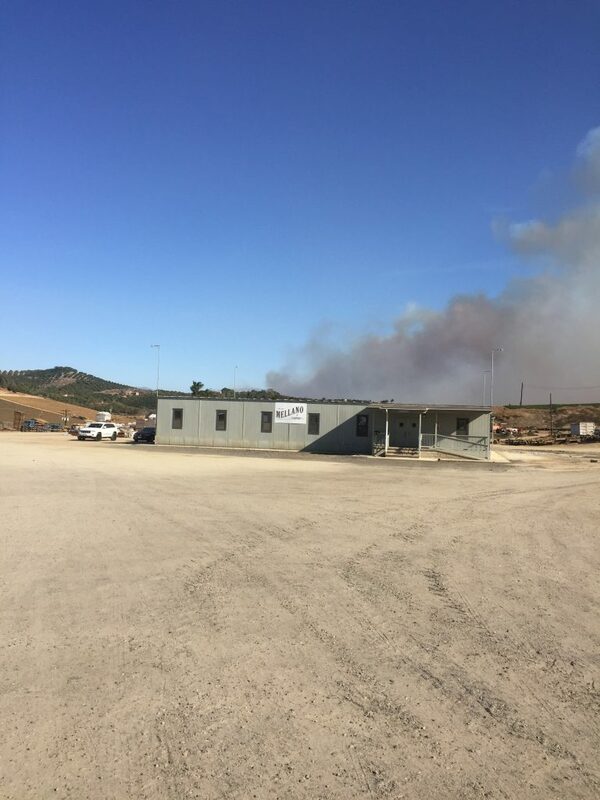 Mandatory evacuation orders have made accessing farms and the daily harvesting flowers challenging, but those evacuation orders are anticipated to be lifted soon. In Carpinteria, Dani Hahn of Rose Story Farm took to Instagram to share her farm’s story. 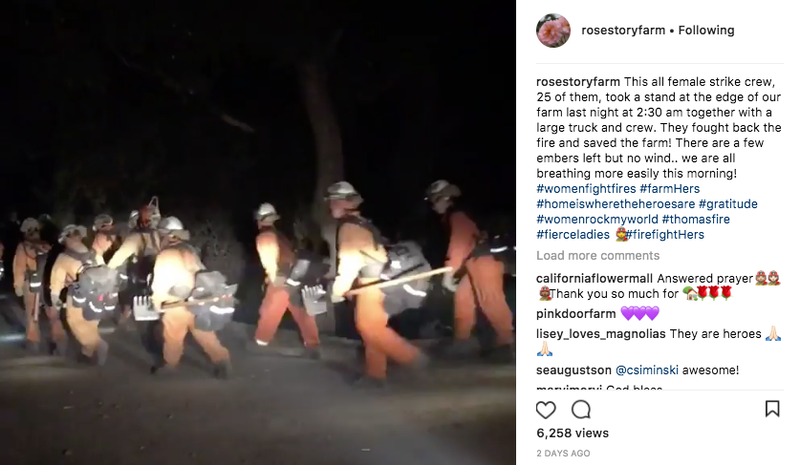 She posted photos of an all-female strike crew, 25 of them, who took a stand at the edge of her farm at 2:30 a.m. fighting back the flames and literally saving the farm. 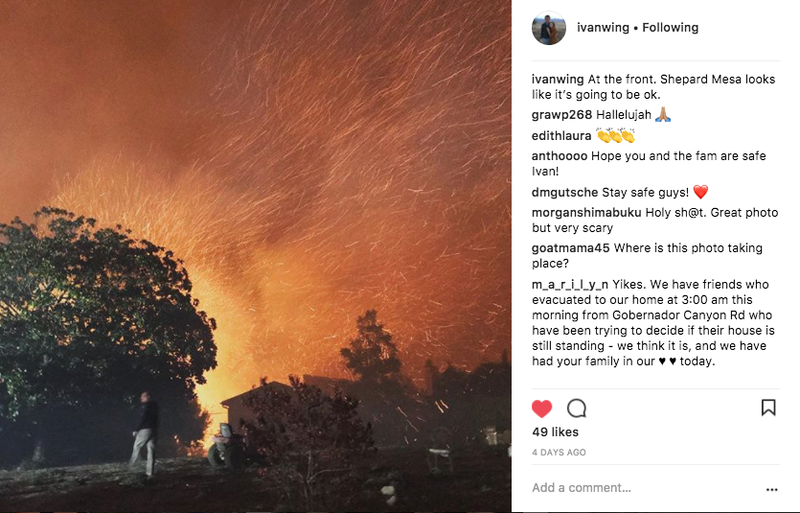 She also shared her concerns about losing the 150-year-old historic home on the farm, posting about the home’s history and thanking firefighters – some posted on her roof – for their efforts. 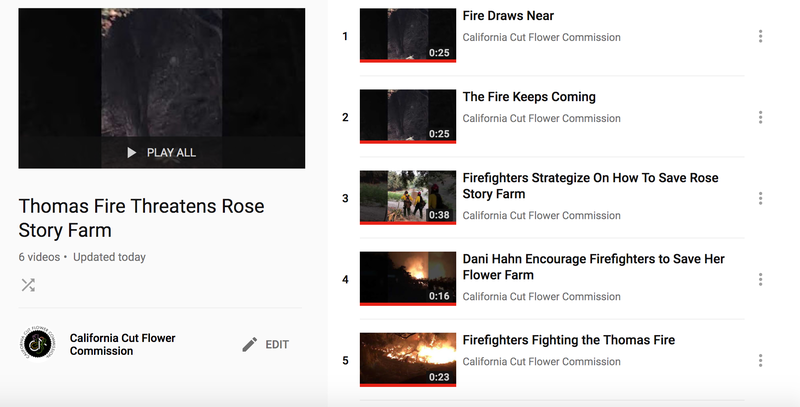 Clic to watch this video of an all female strike crew that took a stand at the edge of Rose Story Farm during the Thomas Fire in Carpinteria, CA. And at one point, there were 50 firefighters, eight fire trucks and three bulldozers protecting the farm as the fire approached the property line. Click to watch a playlist of videos provided by Dani Hahn of Rose Story Farm. Hahn lost one row of about 200 rose plants, but is in back in business and shipping out roses. What she feels most deeply is gratitude. The Thomas Fire rages above Rose Story Farm in Carpinteria, CA. On Tuesday California Cut Flower Commission CEO & Ambassador Kasey Cronquist traveled to Carpinteria Valley to speak with local county and fire officials regarding the importance of California’s cut flower industry in Carpinteria. He also had a chance to visit with farmers in the valley and survey the fire damage in the community. 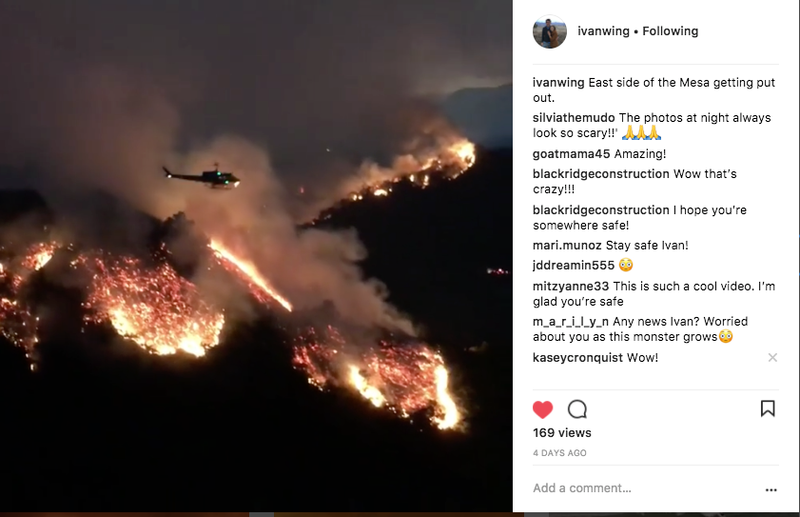 Ivan Van Wingerden of Everbloom, Inc. provided a glimpse into what was happening near his farm through his Instagram page. Ivan Van Wingerden watches a helicopter drop water on the fire near his home. The Thomas Fire’s fury is shown in this photo by flower farmer Ivan Van Wingerden. And flower farmer David Van Wingerden, owner of Westland Orchids, became a regular on Facebook Live, sharing his experience across several days as the fire approached his farm, seemed to come terrifyingly close, but continued to calmly share that their farm was in the clear. 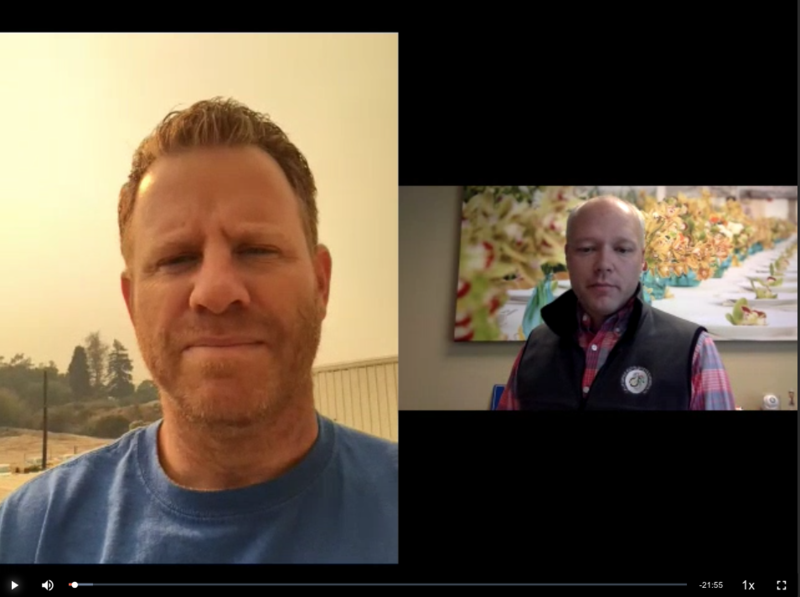 David Van Wingerden speaks with CCFC CEO Kasey Cronquist during the fires in Carpinteria. The Lilac Fire in San Diego is now 95 percent contained, but drew awfully close to Mellano & Company’s farm in San Luis Rey in Oceanside, California. Smoke from the Lilac Fire rises behind Mellano & Company just before the company was evacuated. 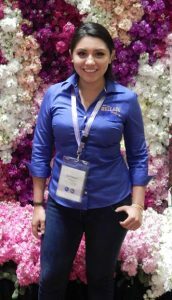 Nathalie Olvera works for Mellano & Co. in sales. Her family’s home was one of the first to be lost during the Lilac Fire in San Diego County. A GoFundMe page has been created to assist the Olvera family during this time. 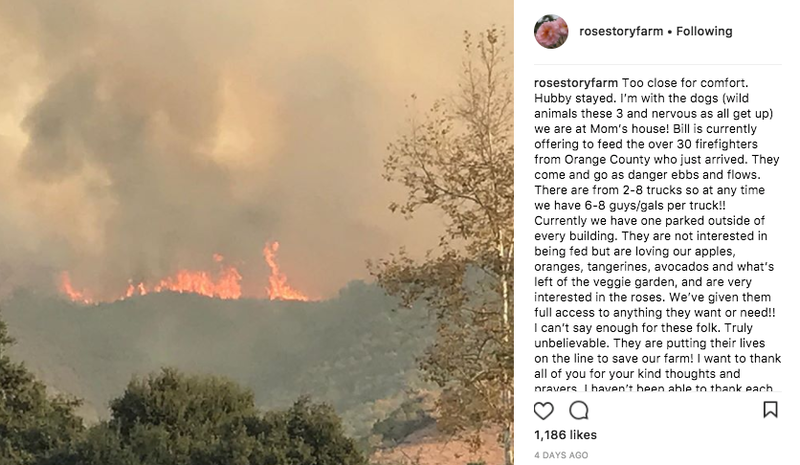 While California’s flower farms were spared by these wildfires, employees, their families and friends throughout the industry have all been touched by someone who lost their home. Sadly, Mellano & Co employee Nathalie Olvera lost her home in the Lilac Fire. The Olvera family home was one of 157 structures lost in the fire. A GoFundMe campaign has been created to help the family through this difficult time. All in all, the situation could have been much worse, but over the last week there have been some incredible examples of heroism by first responders and communities coming together to help one another. Like Hahn, gratitude is the overwhelming feeling among flower farmers. We had a similar fire down here in 2014. Luckily the fire crew kept it from taking our greenhouses. I believe the fire crew saw our large propane tanks as a major threat. They were able to stop the fire at our property line. We did lose our whole late crop when the electric company had to shut down our power. The fire was under the power lines. Our late orchid crop ‘cooked’ with out fan power for 2 days when we were unable to cool the greenhouses. The plants were fine. The ash clean up was another situation besides the delay in getting paid for the ruined flowers and clean up. I hope growers don’t encounter the same problems I had. It took more than 2 years to get paid for PART of what we lost.